samanu (wheat pudding) for affluence. Samanu is sweet, although it is made entirely of wheat berries that are soaked and sprouted for days, then cooked all night and pounded into a paste. The sweetness comes entirely from the wheat’s natural sugars. senjed (dried fruit of the oleaster tree) for love. When the oleaster tree is in full bloom, the fragrance of its blossoms is said to make people fall in love. sekeh (gold coins). Placing them in your haft seen means that your money will multiply over the course of the year. I must put the wrong coins in mine, because that one never seems to work for me. 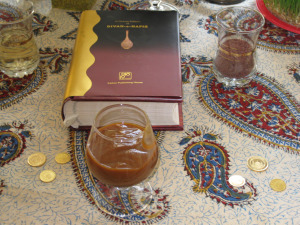 Koran or poetry: I put a copy of the Iranian poet Hafez’s Divan in the center of my haft seen. It is trilingual: Persian, English and German and represents my three cultures. sombol (hyacinths) because they are among the first flowers to bloom in the spring. And they smell nice. Yaz (jasmine) – this isn’t traditional, but jasmine is the first flower to bloom in my garden, so in it goes. Pastries – to make the coming months sweet. The mirror and candlestick are also symbolic. I light the candles at night and the flame reflects off the mirror, creating the illusion of fire and water. This makes me think of the Zoroastrians, who started the tradition. Usually there are also a few goldfish swimming in a bowl of water. I leave this out because I never know what to do with little tykes after the holiday is over. In Iran, vendors stand on the corner in every bazaar with big tanks and lots of goldfish swimming around. They will scoop the fish out with a net and deposit them into a water-filled plastic bag for you to take home – quickly before the oxygen is gone. Apart from being pretty, the goldfish serve a practical function. They tell you precisely when the year changes. The fish swim in circles in one direction, but at the moment the new year arrives, they abruptly turn around and head the other way. No matter how long I sit in front of the fishbowl and stare, I’ve never seen this amazing event. It must happen when I blink. 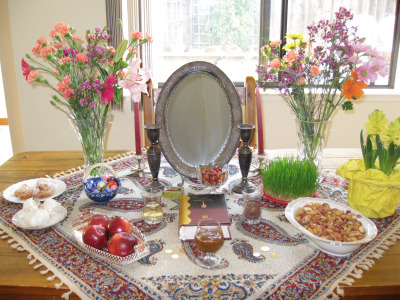 Our haft seen will remain in place until the thirteenth day of Norooz. 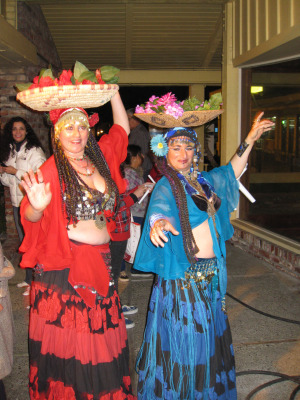 Then we will take the sabzeh outside and scatter the sprouts away for good luck. I could have left my seven-league boots at home, but it was fun anyway. No fireworks or beating pots with metal spoons, but there was enough kebab to feed a small, hungry nation. I’ve never understood why we ring in the new year in the middle of the winter, when the world is cold and sleeping. The Zoroastrians of ancient Persia had a better idea. They celebrated the new year on the vernal equinox, so that the first day of the year coincided with the first day of spring. 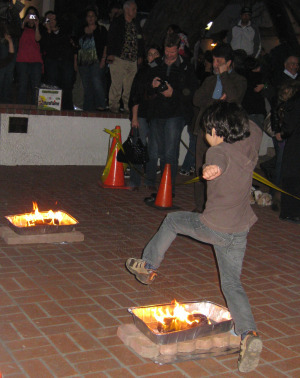 In Iran, this tradition continues. 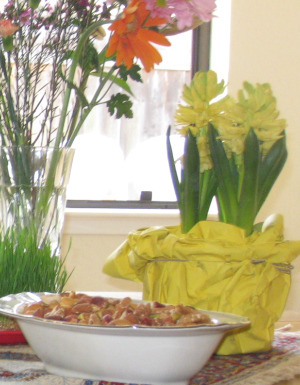 They call it Eid-e Norooz, or the celebration of the new day. And the year doesn’t arrive at midnight each time, but is calculated precisely to the moment the sun is positioned directly over the equator, when the day and night are of equal length. This year that time is 10:32 a.m. (PST) on Saturday, March 20. Starting the year in springtime makes perfect sense to me. Where I live, the old Modesto ashes that line the streets of my neighborhood are just starting to put on new leaves. The hyacinths have been blooming for a week already. But when the pink buds on the jasmine in my yard open into tiny white stars, then I know Norooz is just around the corner. By the time the actual day arrives, there will be enough blossoms for me to bring inside to fill the house with their scent. The world feels fresh and new. Norooz starts with spring cleaning, or khooneh tekooni (literally: shaking the house). This isn’t the superficial house cleaning I usually get away with – dragging the vacuum across the high traffic areas, wiping down the counters, running a duster across the grimiest surfaces. Khooneh tekooni means getting into every nook and cranny, shaking out the carpets, washing the windows. It also means buying new clothes. Because once you’ve got a sparkling new house, how can you sit around in the same clothes you wore throughout the old year? Every March, I resolve to get my act together and shake my house until it shines. I will start a week in advance, I tell myself, and do a bit each day. And every year, I hone my procrastination skills until they are much sharper than my cleaning ones. Yesterday, I made the mistake of starting with my office. By the time I dug through the mountains of paper and the desktop came into view, I concluded the job would take months. There was nothing for it but to run out and buy that new outfit. It was my sister-in-law who gave me the best reason for cleaning my house from top to bottom. “If you don’t, bad luck will chase you for the next twelve months.” I could use a bit of luck. So here goes. I still have five days left. One room each day? That sounds doable. I may be housecleaning-challenged, but Norooz is still my favorite holiday, and the fact that it lasts for two weeks only makes it more special. This week I’ll be blogging about the parts of it I like best. 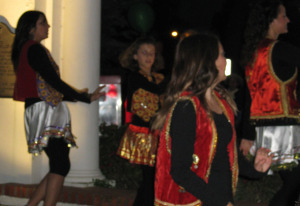 Do you celebrate Norooz, the vernal equinox or just the advent of spring? Check back in the coming days and tell me about your own favorite rituals.